The Samedi 27 Race 8 is a serious 27.5″ eMTB with 160mm travel suspension, designed for rough mountain trails and downhill use. First impressions are how sleek and agile the bike looks. Next, how well the battery integration works in combination with its semi-integrated motor. The Race 8 is indeed a very cool cat. Not only does it have looks to kill, but performance and component levels to match. It boasts variable thickness 6061 T4 T6 aluminium hydroformed tubes for ultimate strength yet remains lightweight. Featuring a bespoke design race geometry, the Samedi 27 Race 8 is ready to blow the competition out of the water. The frame architecture offers one of the lowest centres of gravity on the market resulting in amazing efficiency. 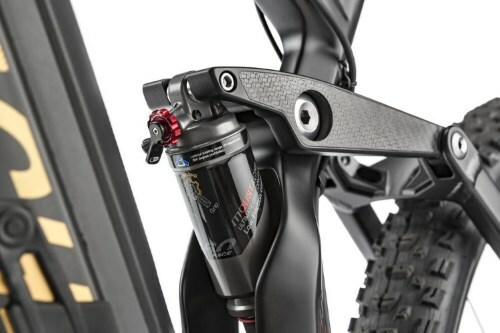 Front suspension is taken care of via a set of classy, ebike specific Fox 36 Performance forks. With a long 160mm travel and black aluminium reinforced stanchions, the Fox’s really do out-perform many of the competition. On the rear is Moustache’s own ‘Grip Control Ultimate’ shock. Its hard anodized coating ensures low friction and dynamic rebound control for insane grip on the rear. As a result, the ride is perfectly balanced and stable. There’s lots of traction without any wallow, and zero bob when hard pedaling! Steering is strong and precise with great handling. New for 2019 is a 760mm Moustache JUST Carbon T700 handlebar that’s both lightweight and tough, weighing only 205g! Ultra powerful and progressive Formula Cura hydraulic disc brakes are super-responsive. Furthermore, they feel precise, powerful and enduring. 200mm rotors on the front and 180mm on the rear ensure immense stopping power at all times. The Samedi 27 Race 8 is powered by the Bosch Performance CX, the most powerful and highest torque (75Nm) in the Bosch range. eMTB mode as standard, the Race 8 adapts easily to all types of terrain. 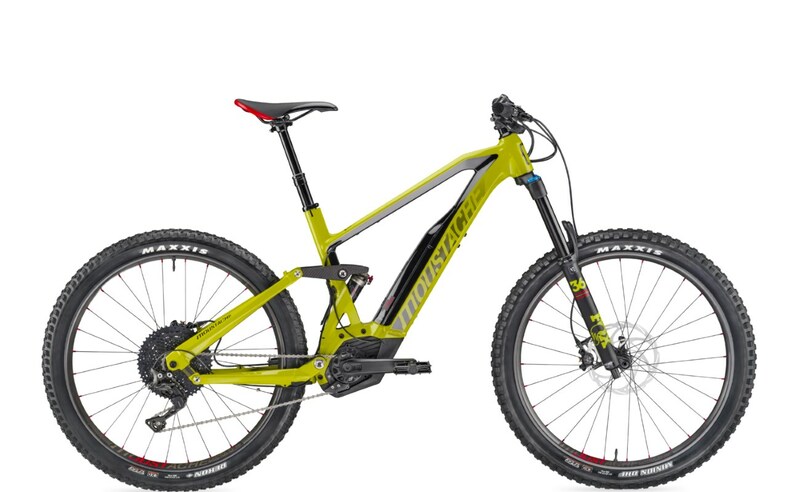 Powered by a huge 500Wh battery ensures extended range and hours of fun on the downhills and trails. 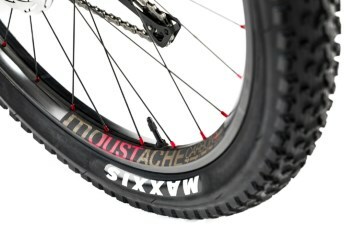 The Race 8 features asymmetrical Moustache JUST Carbon rims, strong and lightweight. They’re eBike specific, 35mm wide and tubeless compatible. CNC aluminium hubs with sealed annular bearings ensure low friction and maximum autonomy. Comprising 4 double ratchet and 28 straight double butted flat spokes, ensures optimal transmission. It’s both stable and agile thanks to a set of 27.5×2.8” Maxxis Minion DHF tyres on the front and 27.5×2.8” Maxxis Rekons on the rear. The Plus sized tyres stick like glue to any surface and provide the perfect balance of grip and maneuverability. High end Shimano XT 11-speed gearing combine with a huge range 11-50T cassette.. The Samedi 27 Race 8 is indeed capable of climbing the very steepest of hills with ease! As expected, there’s a fully integrated Moustache dropper seat-post utilising a hydraulic cartridge and remote lever. With truly gritty performance and such an attractive set of components, the Samedi 27 Race 8 is a real winner. 11-50T, widest range, optimized capacity and autonomy.